The Foundation owns and maintains all of the original library grounds, gardens and buildings as well as the fine collections of artifacts and rare books. 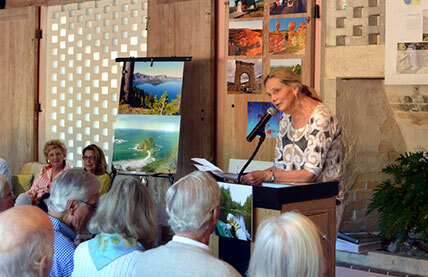 Throughout the year the Foundation sponsors many of the events and presentations that take place at the Library. The Lee County Library System now provides the library services. Professional library staff manage the print, audio visual and digital collections. They provide computer assistance, e-clinics, circulation and reference services and also present story time for children. The JF Library Foundation was officially formed on April 26, 2012. Prior to the formation of the Foundation, the Johann Fust Library was one of two libraries that operated on the island, the other being maintained by the Lee County Library System. (Click here to read about our Legacy.) After several years of planning, negotiating and renovating, the Board of Directors of the Johann Fust Library formed a partnership with Lee County and entered into a unique public/private relationship. As part of the agreement the JF Library Foundation’s Board of Directors raised over $1.5 million dollars from the Boca Grande community to renovate the buildings and the grounds. The design team consisted of architects Sam Holladay and Michael Epstein and interior designer Pam Holladay, all of Seibert Associates, Sarasota; builder Pat Ball Construction, Sarasota and landscape designer Mary Ellen Flanagan of Punta Gorda. The Grand Opening took place on June 25, 2013. The JF Library Foundation is a non-profit 501(c)(3) private operating foundation. Donations are tax deductible. During the “season,” the Foundation sponsors and collaborates with various island groups to further its mission to present literary, artistic, entertaining and other stimulating programs. The Johann Fust Literary Series features both local and other prominent authors reading and discussing their writing. Since 2013, these programs have been made available for viewing on DVDs provided by the foundation. Every other year, springtime brings Poetry in the Garden, a dynamic program of The Live Poets’ Society of Boca Grande, in which visiting and local poets read aloud from their own work. History Bytes, a popular offering by the Boca Grande Historical Society, occurs every Wednesday morning in February. Presentations frequently include talks by noted historians and by local residents who have first-hand experiences of the island’s history.